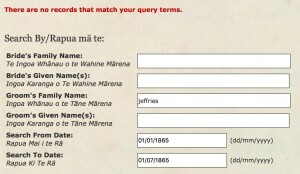 I think I first meet the Jeffries family when I received my grandmother Olive Ireland’s (DOB 1887) birth certificate. It has her mothers name as Mary IRELAND, formerly JEFFRIES. And her maiden name as MCDONALD¹. The informant was listed as Flora JEFFRIES, sister¹. I had another family to hunt out. All the usual questions raced around my head. Who was Mr Jeffries? 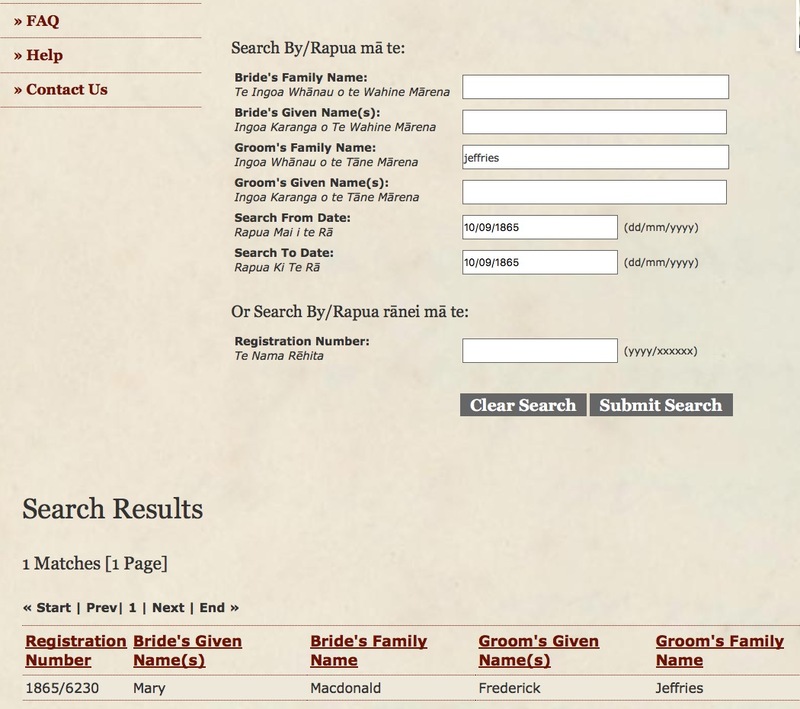 When did my great grand mother (Mary Scott MCDONALD DOB 1847) get married the first time? Was it the first time? Were there other children? How many half brothers and sisters did my grandmother, Olive Constance Beatrice IRELAND, have? 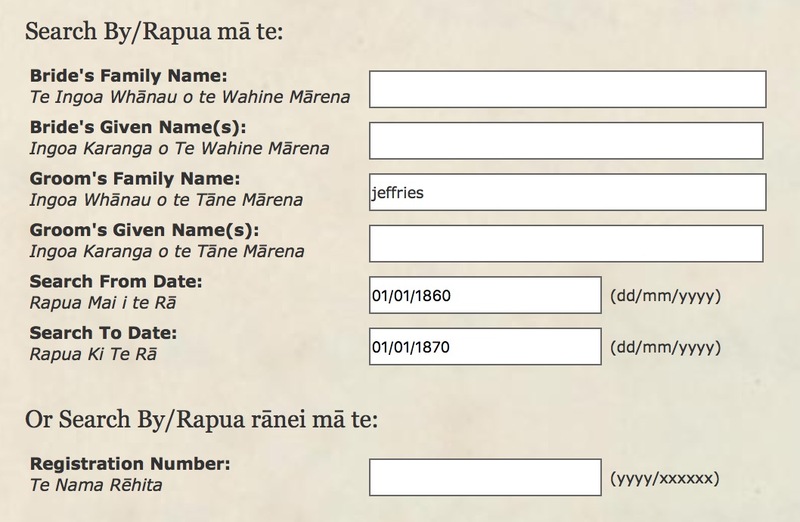 For New Zealand family research my first place of call is Births, Deaths and Marriages Online (NZBDM). 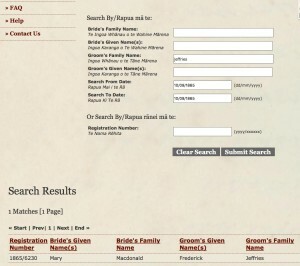 Here is an example of a marriage record². This is one birth result². A slightly different birth search found a possibility for another child called Ada Teresa². This information should be verified with certificates but this can be costly. Here is a tip on how to discover the date of an event in the NZBDM site without the certificate. Once you find the event you are looking for keep searching but reduce the time span for the date fields. See the first of the next 3 images. Sometimes other events will be in the search results. Ignore these. 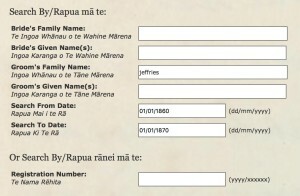 Once you are outside the possible date a no records match will show (Image 2). Expand the date in the other direction to get a positive result. Then reduce the dates until you have one day left. This is the date the database has for the event². Family history research is enjoyable when you find a clue and chase it. 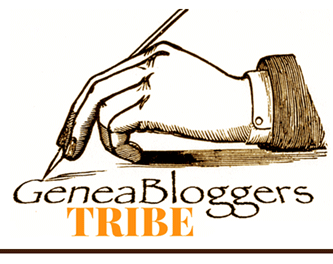 The JEFFRIES are now in my tree and in this TravelGenee #atozchallenge J – JEFFRIES blog post. 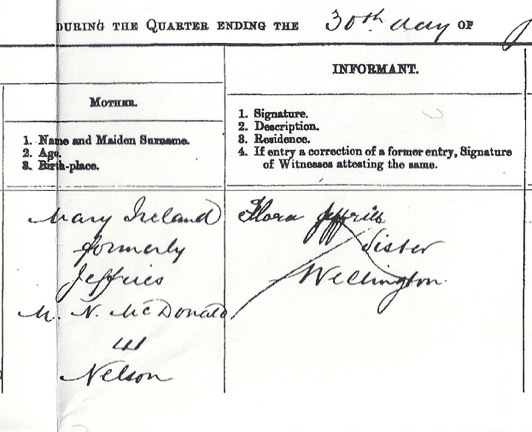 Olive Constance Beatrice IRELAND’s birth certificate,1887/1363. 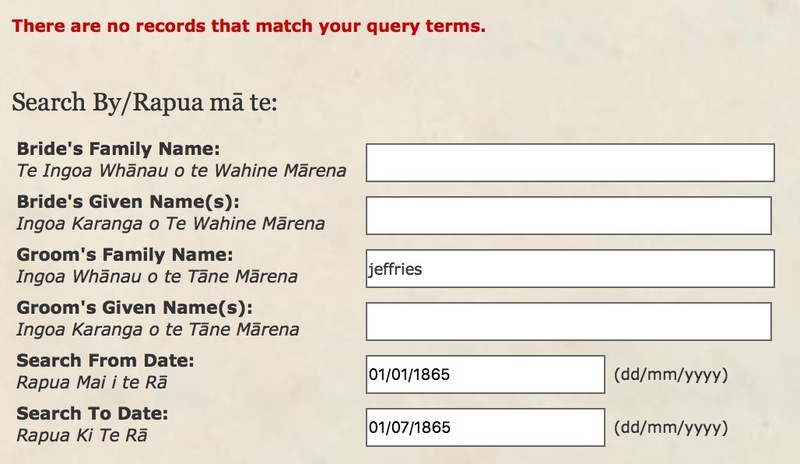 Various search results from Births, Deaths and Marriages Online (NZBDM). Fredrick JEFFRIES & Mary MACDONALD marriage Certificate, 1865/6230. This is part of the A to Z Blogging Challenge for April 2016: Letter J for JEFFRIES. 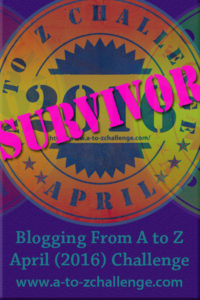 You can read more about the A to Z challenge and my other posts. 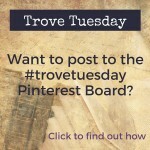 Or search on social media with #atozchallenge. Thanks for the tips on NZ…I keep wondering if my “lost” McSharry went there to build more railways. I’ve got a CD by Jan Gow giving tips tracking ASD’s, as she calls them. I’ll update you on how to check out people that may have gone to NZ. Clever tip with the dates, thank you!